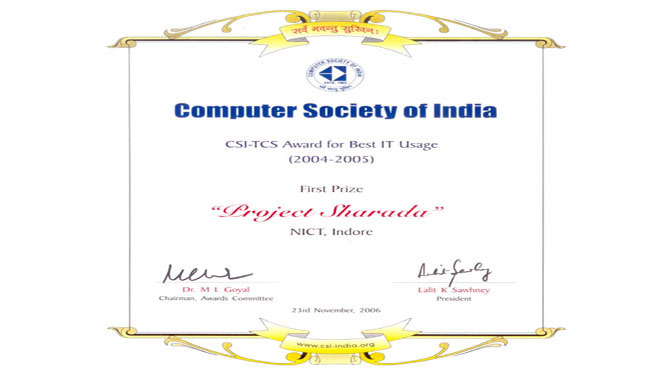 NICT-Indore has been awarded 1st prize in the CSI - National IT Awards 2004-06 for their entry "Project Sharada" under the category "CSI-TCS Award for Best IT Usage" for the year 2004-05.The award is received by Mr. Mukesh Hajela (CEO, NICT), Mr. Mahendra Gupta (CTO, NICT), Mrs. Indira Yadav (Director, Primary Education, Municipal Corporation, Delhi) and Mr. Jitendra Choudhary (COO, NICT) from Mr. Lalit Sawhney, CSI President at their 41th Annual Convention held at Science City, Kolkata on 23rd November, 2006. 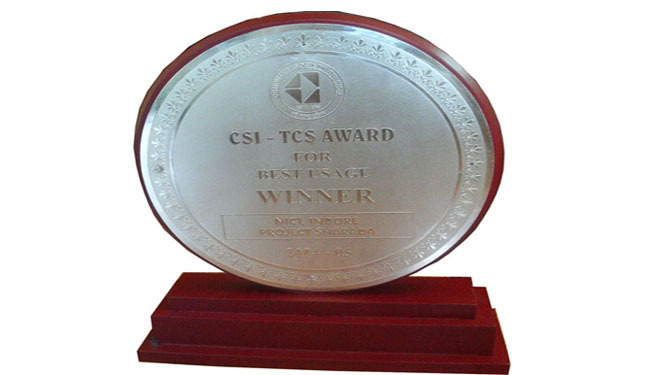 The award is received by Mr. Mukesh Hajela (CEO, NICT), Mr. Mahendra Gupta (CTO, NICT), Mrs. Indira Yadav (Director, Primary Education, Municipal Corporation, Delhi) and Mr. Jitendra Choudhary (COO, NICT) from Mr. Lalit Sawhney. Six Zones, 487 Schools equipped with 2537 HCL-PC, UPS, Gensets, Printers, Furniture, Networked in redhat -open source and CBT software's from RGSM and Azim Premji Foundation, 1.5 Lac children studying in MCD, Primary schools from urban poor community were benefited targeting +7 Lac children's over the period of 5 years. The project has made primary education joyful and contributed to "Going to School Mission".